Three of baseball’s winningest managers, Bobby Cox, Joe Torre and Tony La Russa, were unanimously elected to the Hall of Fame on Monday, December 9, 2013. According to ESPN, all three managers were selected on all 16 ballots when the committee met at the MLB winter meetings on Sunday in Lake Buena Vista, Florida. 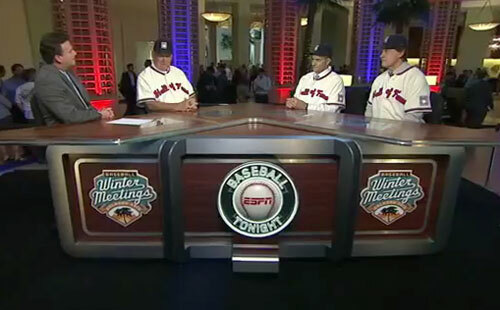 The induction ceremony will take place on July 27, 2014 in Cooperstown, N.Y.
Photo shows former baseball mangers, Bobby Cox, Joe Torre & Tony LaRussa speaking to ESPN after they were elected to the Baseball Hall of Fame on December 9, 2013. This year’s committee included Hall of Famers Rod Carew, Carlton Fisk, Whitey Herzog, Tom Lasorda, Paul Molitor, Joe Morgan, Phil Niekro and Frank Robinson; Blue Jays president Paul Beeston; retired club executive Andy MacPhail; Phillies president Dave Montgomery; White Sox chairman Jerry Reinsdorf; Steve Hirdt of the Elias Sports Bureau; Bruce Jenkins of the San Francisco Chronicle; BBWAA secretary-treasurer Jack O’Connell; and retired Fort Worth Star-Telegram reporter Jim Reeves. Sports Speakers 360 is a booking agent for motivational sports speakers. If you would like to book baseball speakers and MLB coaches like Bobby Cox , Joe Torre or Tony LaRussa for a speaking engagement, autograph signing, guest appearance, product endorsement, baseball camp, charity fundraiser or corporate event, contact our booking agent for appearance and speaker fees or call 1.855.303.5450.